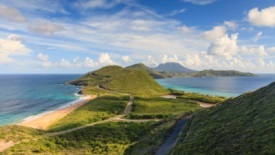 St. Kitts is home to some of the best examples of West Indian architecture, all of which is set amid a dramatically beautiful landscape. The best shore excursion is a well-organized island tour, featuring a visit to the 17th-century British fortress at Brimstone Hill and the sites of the capital. The beaches here are magnificent, including Friar's Bay, which opens to the Atlantic and the Caribbean.